PW Mod v4.5.0 has been released and is now ready for install in your control panel! The updater will only overwrite the files which come default with the game. 1. Backup your config / uploaded files to your own computer. (if you have uploaded anything through the FTP server/Filemanager). 2. Stop your game server. 3. Go to your Configuration Tab and change the command line to: "-r myconfig.cfg -m PW_4.5". Hit Save. 5. When updating is done, the server starts automatically. If you need to restore (re-upload) your configuration files, follow the next steps. If not, your game server is up-to-date! 7. Upload your config files. Sun of the blog 'SWAT4 News' organised a competition for the 10th anniversary of SWAT 4. The competition is over and we have a winner. |ELITE|Kenny's revamped dance video is voted number 1 by the judges, and will be found here, at SWAT4Stats.com & on the DExUS server browser. "Greetings to the SWAT4 community. To this day I remember Swat4 to be one of the best MP experiences in my gaming life, and to see people still getting naded, tasered, arrested and walking the maps, guns blazing is agreat feeling for me personally. I was contacted by one of the S4N members about my video and am truly delighted. Once again, thank you for this great honor." Finally we managed to integrate rFactor 2 into our customized control panel. As you might have noticed there are little to none GSP's providing rFactor 2, due to its complexity. We are now looking for users who are willing to test our free of charge test servers for 1 month. In exchange we will ask you what you think we should improve in our control panel, in order to improve the user-friendliness. Please send an email to support@markmods.com or reply here, if you are interested in a free test server! MarkMods offers Altis Life RPG out-of-the-box, with all ARMA 3 game servers we provide. It requires little to no knowledge to get Altis Life setup and running on our game servers. Though, please be aware, the mod itself is pretty complicated so modding the server requires quite some knowledge, such as database/mysql knowledge and for those advance modders out there, real coding knowledge. Get a Free Full Root Permission MySQL server. In your control panel, select your ARMA 3 server, go to the "MySQL Tab", you will find a blue info box down below, with a button: "Get a Free MySQL server now". Hit that button! (In case you do not see that, you should see: "Go to your MySQL server", in that case you already have the full root permission mysql server). Goto your MySQL server control panel and set a Root Password, this is done in the Configuration Tab of your MySQL server control panel. Restart the MySQL server after changing the password. Wait for the MySQL server to show Online in the control panel. on: 09 May 2014 5 MarkMods Game Server Hosting / Battleye Extended Controls (BEC) / BEC rental now available! It comes for free with your ARMA server, simply send us an email (support@markmods.com) with the request to assign you a BEC server! This topic has been moved to Troubleshooting & Technical help. 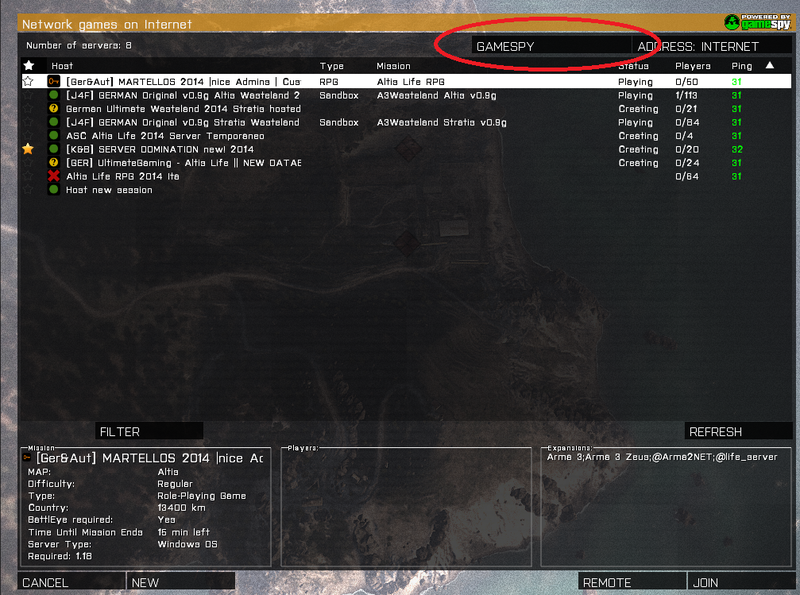 on: 02 May 2014 7 MarkMods Game Server Hosting / ARMA 3 / Can't find your ARMA 3 server in the server list? So here is one for you. To be honest, we cannot get our head around this one. Somehow Bohemia Interactive decided to integrate 2 server lists into 1 game. Wauw..
And even better, something, yes, "Something", influences on which list your game server shows up. And at this moment we are not sure what this "something" is. As of 1.18 most ARMA 3 servers seem to disappear from the Steam server list, which is, of course, the default server list being used in your ARMA 3 Client. ARMA 3 its patch to v1.68 is now ready for update on all Hosts! 4. When updating is done, the server starts automatically. 6. Upload your config files. Germany Hosts ready for update - 100%. 1.10 is now ready for update on all Hosts! This topic has been moved to Approved requests. 1.158 (Warband) and 1.104 (NW) is now ready to be installed by you on ALL Hosts! 1.103 (Napoleonic Wars) + PW 4.3 is now ready for install on all Hosts! 1.157 (Warband) is now ready for install on all Hosts!